Multiple sclerosis is an autoimmune disease that leads to the destruction of the myelin sheath of the axons of the central nervous system. It causes neurological problems of varying severity. The disease generally begins between 20 and 40 years of age and often evolves in spurts punctuated by periods of remission and the regression of symptoms. It affects approximately 2.5 million people worldwide, the majority of which are women (a ratio of three women to every man). Demyelination is the destruction of the myelin sheath that encircles and isolates the axons of neurons. It causes a disturbance or interruption in the conduction of nerve impulses and can result in irreversible lesions of neurons. It leads to various neurological problems, depending on the location of lesions. 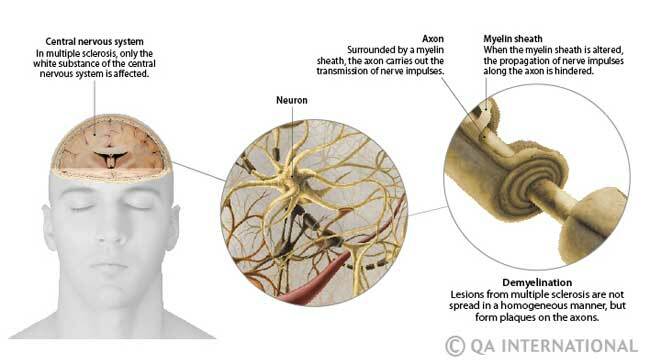 The demyelination of axons can be caused by an autoimmune disease (multiple sclerosis, systemic lupus erythematosus) or by an infection (Lyme disease, AIDS). The factors responsible for multiple sclerosis are still poorly known and may have various origins. The disease particularly ravages Northern Europe, Canada, and the northern United States, which suggests the existence of an environmental or genetic factor in its appearance. The disease can also be triggered by a virus (flu, herpes) in vulnerable people. Several research teams are opposed to the idea of a hypothetical link between the appearance of multiple sclerosis and vaccination against hepatitis B. The World Health Organization also rejects this idea and insists on the great benefit of the vaccine. The evolution of multiple sclerosis can take several forms. In most cases, the symptoms appear in flare-ups that alternate with periods of complete remission. After several years, the neurological state is gradually aggravated by the flare-ups. In other forms of the disease, the impairment develops progressively and continuously, without periods of remission. Multiple sclerosis causes various neurological problems that depend on the location of demyelination plaques: problems with vision, sensitivity, balance, walking, urinating, mood, etc. After several years, the disease can generate severe impairment (paralysis, blindness) and cause an individuals loss of autonomy.